Pulaski, NY: Living in Upstate New York wintertime is always unpredictable. Some years we are faced with brutal conditions. I fished the Salmon River with clients in temperatures as low as -38 degrees (not one of my favorite days). Meanwhile, so far this winter has been mild. 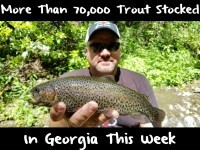 If these conditions persist February is going to be a good steelhead fishing month. Consider that some years it gets real cold. And, when this happens drift boaters and shore anglers get locked into the upper river because the rest of it is inaccessible due to ice. However, if we continue to get the warm weather we’ll have more open water to fish. Some don’t realize that most years a bunch of our steelhead are stuck under the ice in January and February when the temperatures are often below freezing. I’m not just saying this year has been as good or better than last; there are a few reasons why it’s true. First off, from all the guides I talk to on a daily basis we believe it’s been as good or better because there’s even more fish this year. Oftentimes in December the push of steelhead coming out of Lake Ontario will slow down, but this year we saw fresh fish moving in through early January. I know this because guys were able to fish the bottom end of the river since it hasn’t been locked up until now. And even a few weeks ago they were still catching fresh fish. 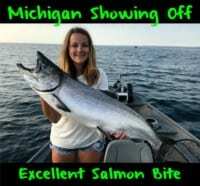 In addition, the mild water and more open water has enabled us guides and shore anglers to spread out and fish sections that we normally can’t focus on this time of year. On the other hand, I haven’t seen much change in the size of the fish. We aren’t seeing an exceptional big fish year, but we are getting the same quality fish we always get. With that said, early in the season we did see more 15-18 pounders than we are accustomed to. They are still in the system somewhere right now, as long as they haven’t been caught yet. As good as fishing is right now we still have a long season that extends right into mid May! Regardless of what you like to call them; steelies, ironheads, chromers or metalheads they are here for only one thing; to eat eggs! You can catch them on any type of egg imitation, fly or bead, but the bottom line is some days you cannot beat the real thing. Whether you bottom-bounce fast water, float-fish the pools, boon-dog or fish sand spikes on the shoreline, you need quality eggs in your arsenal. Many guides and day trippers do well in November and December with Pautzke Fire Cure skein, but January and February are better served with small eggs sacs tied with loose eggs. In the dead of winter these sacks generally out fish skein and are much easier to work with in colder temperatures. I use Fire Cure during steelhead season. Honestly, I haven’t even tried BorX O Fire much. The Fire Cure has always worked for me, so I haven’t needed to use BorX O Fire. It’s the old if it’s working keeping using it scenario. And, my clients have been using the Fire Cure for years and catch fish everyday. Natural Fire Cure is my favorite color. Don’t get me wrong I have eggs made with orange and pink Fire Cure in the boat, but usually the brighter colors are reserved for stained or tainted water and we don’t see that much on the winter on the Salmon. I’m usually using brown trout eggs in the winter, although sometimes I have to use salmon eggs if I’m low on the brown trout eggs. Brown trout eggs are kind of an orange color, but not as bright as if I use the orange Fire Cure on them. That’s why I like natural Fire Cure the best. It keeps the eggs the color they are when you take them out of the fish. Guys on the Salmon River use all sorts of mesh for their spawn sacks. I like blue and white mesh for my spawn sacks in the winter because our water generally runs clear and that’s the colors our steelhead prefer. There can be steelhead anywhere, but in February you’ll want to focus on the slower, deeper pools. As steelhead move into pre-spawn they are staging in the bellies of the deeper, slower holes kind of hanging out waiting for spawn time. The bulk of them start spawning in March and April. 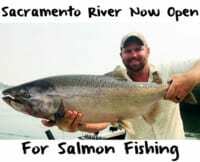 And, as long as the river doesn’t get locked up the entire system will hold steelhead. There’s more than three full months of steelhead fishing left here in Pulaski. Get your brown trout, salmon or steelhead eggs, grab some Fire Cure and tie them up in spawn sacks any size you like. It’s time to catch some fish. Be careful out there and please put a few back for another day. To locate Fire Cure https://pautzke.com/products_firecure.php while fishing the Salmon River please visit Fat Nancy’s Tackle Shop in Pulaski http://www.fatnancystackle.com, All Seasons Sports in Pulaski http://www.allseasonssports.com or Bass Pro Shops in Auburn http://www.basspro.com.